After entering the gallery and exchanging greetings with gallery-keeper Ron Segev, I looked over his shoulder and was almost immediately aware that I was looking at something profoundly disturbing, and profoundly important. I'm referring to the work of Ahmed Alsoudani, one of four artists represented in "The Atrocity Exhibition", currently installed at Thiery Goldberg on Rivington Street on the Lower East Side. 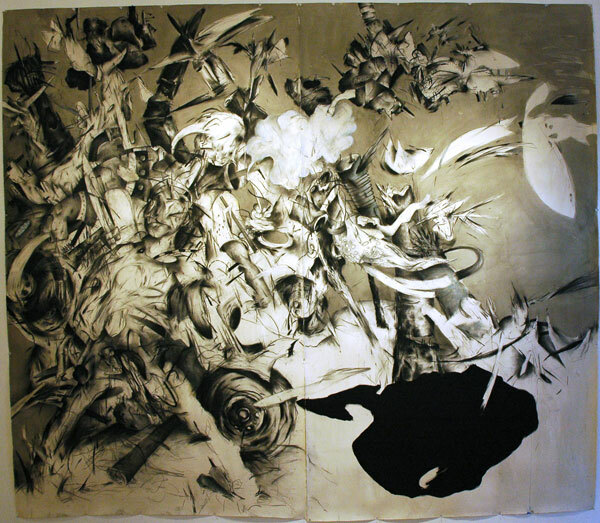 Alsoudani is a young artist, currently living in Connecticut, who was born in Iraq and came to the U.S. after the first Gulf War. He's an American citizen today, but his work has not forgotten the recent history of his native land and the enormous and continuing human disaster whose burden (of the guilt, if not so much the grief) is so closely shared by his adopted home. 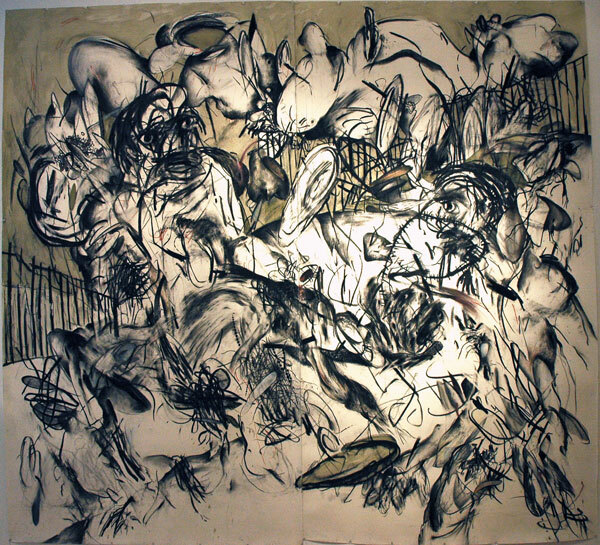 My first thought when I saw these two large drawings was that I was looking at a twenty-first-century "Guernica". 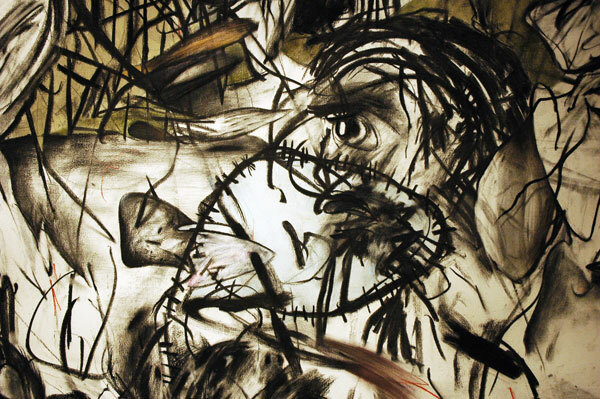 The technique is ultimately Alsoudani's own, but much of his subject and elements of his dramatic representation of violence evokes the truth and the power of Picasso's anti-war masterpiece, the honest outrage of Goya's "Disasters of War", or the grotesque beauty of Miro's anti-fascist "Black and Red" series. All of my references are to Spanish artists whose work was impacted by fascist or imperial violence, but they occurred to me even before I had learned about the artist's origins or had read that his work is intended to specifically address the savagery being visited on the land he had to flee years ago, but where his mother and others still remain. Now I don't consider it a stretch to see a connection in this small gallery space between the atrocities of the nineteenth and twentieth centuries and the memorials created by artists whose own countrymen were sacrificed to power, greed, ignorance and fear, and our own atrocity in our own century and a memorial (or series of memorials, since the cataclysm continues) created by another artist, again a countryman of the sacrificial victims, again the very same scourges. These are fearsomely-magnificent works. I am very grateful to have gotten even a small peek into this artist's extraordinary vision and imagination. I was also very impressed with the work of the other three artists being shown this month, Ben Grasso, who regularly shows wonderful exploding stuff mid-explosion, and who is associated with Thiery Goldberg, Wendy Heldmann, who shows aftermaths, and lives and works in Los Angeles, and Molly Larkey, represented by two sculptures from her "Bombs" series, and who I think is showing in several spaces around town just now, including PS1. By the way, the title of the show, "The Atrocity Exhibition", describes its contents much more straightforwardly than is usually the case these days. If there are no other images in this entry it's only because of the difficulties I encountered in capturing any decent document of the other works. There are a few small pictures on the gallery's own site, but not enough at the moment to keep wise visitors from investigating themselves. Published on July 9, 2007 4:29 PM.